Made with fresh milk butter, beer, almonds, and covered with a dense cloud of fluffy powdered sugar… and do not forget the clove pins, that make the difference. 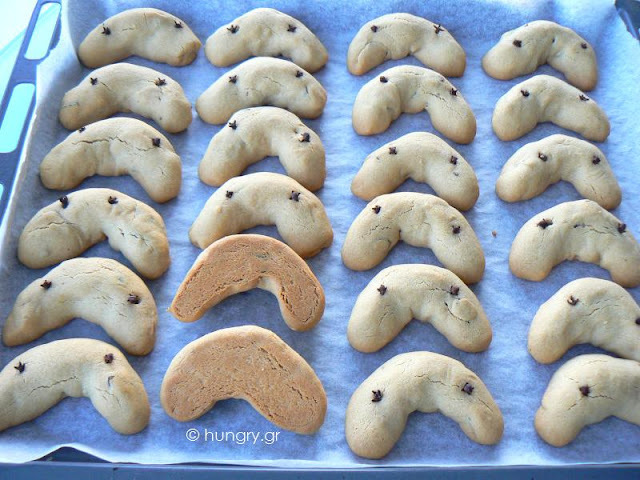 If you have a "traumatic" experience making Kourabiedes, maybe so hard that can break teeth or with a flat taste, try this recipe and will change your opinion about the "real" kourabiedes. Kourabiedes began their sweet life in Persia in the seventh century, shortly after the use of sugar became relatively common in the region. They are made with small variations, all around the Middle East, the Philippines, Spain, Mexico and the United States. 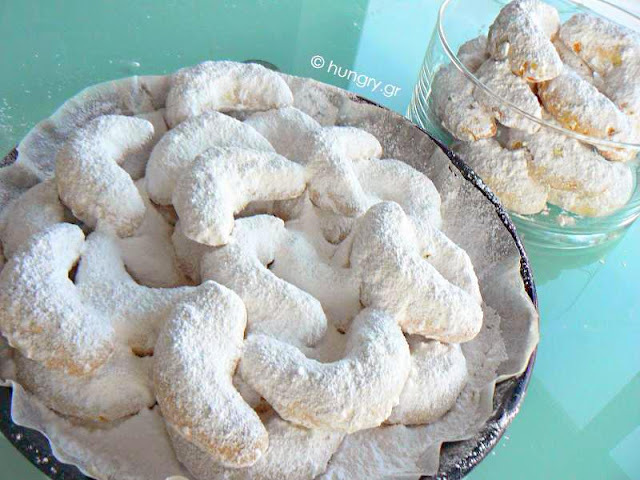 In some areas of Greece the Christmas Kourabiedes are decorated with a whole clove pin embedded in each piece. 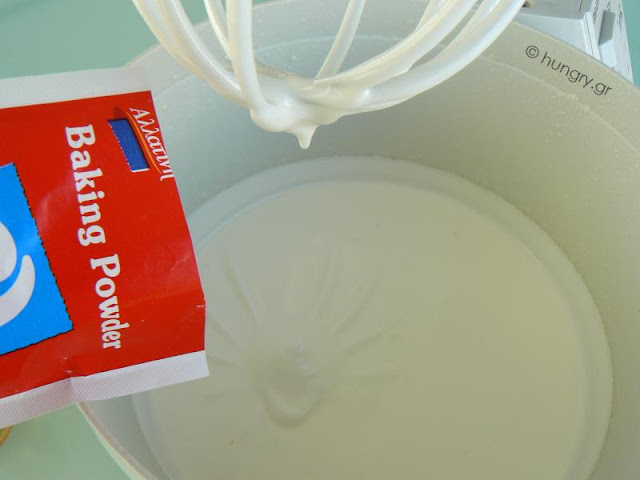 Put the butter, melted but not hot, with a tablespoon of powdered sugar in the mixer bowl on the lowest speed, and let it beat the mix for 1 hour. 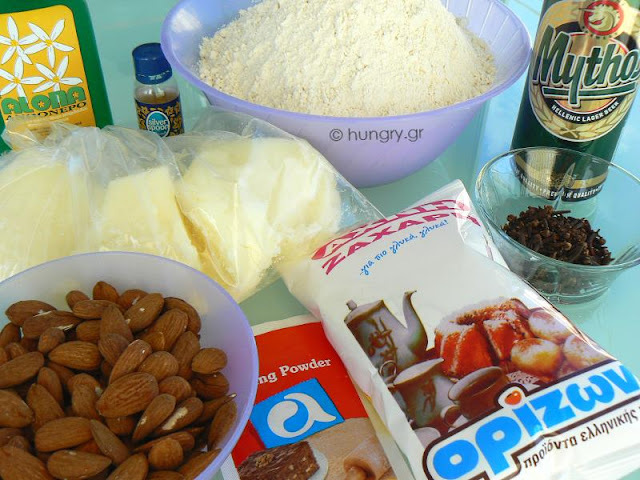 In the meantime bake the almonds in the oven grill for 5 minutes, and if you prefer, cut them in two or crush them into smaller pieces. 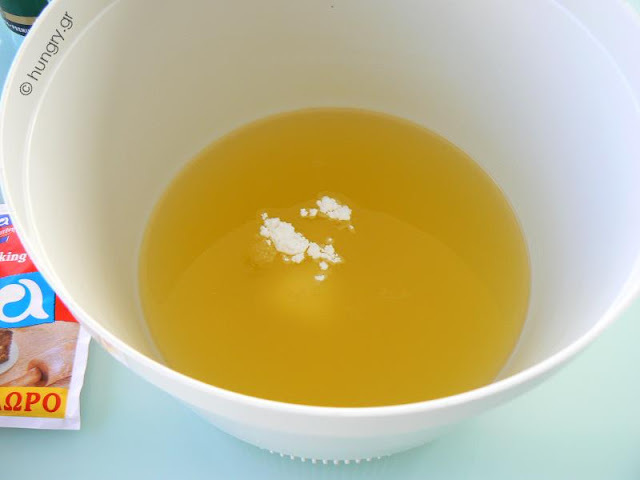 In an hour the butter will thicken and will become as white as cream. …and beer. 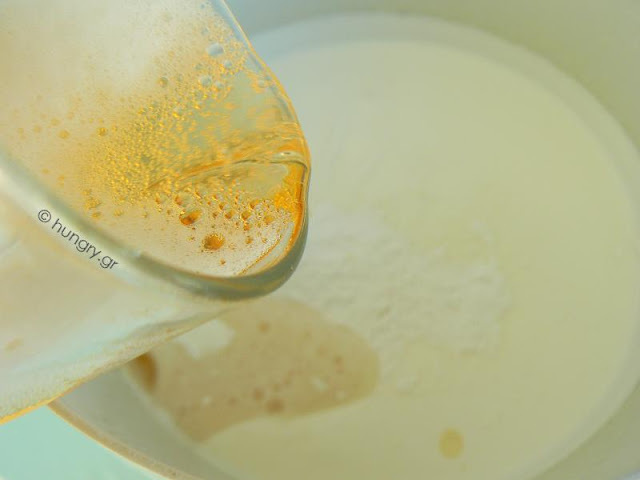 Continue with the mixer for ∼2'. 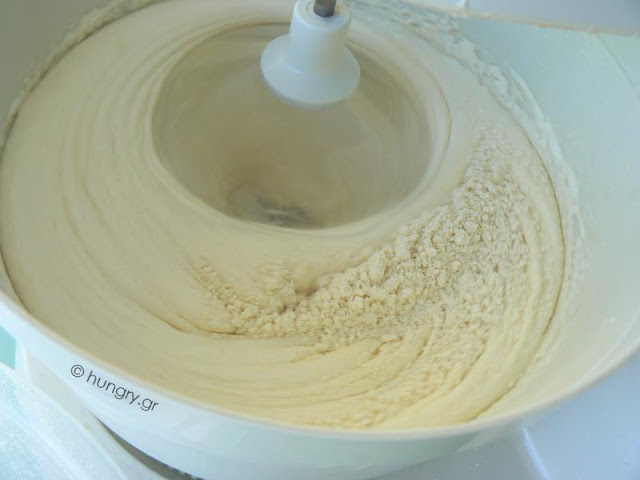 …alternating with the almonds until the flour is all over and you have a soft, pliable dough that will not stick to your hands. 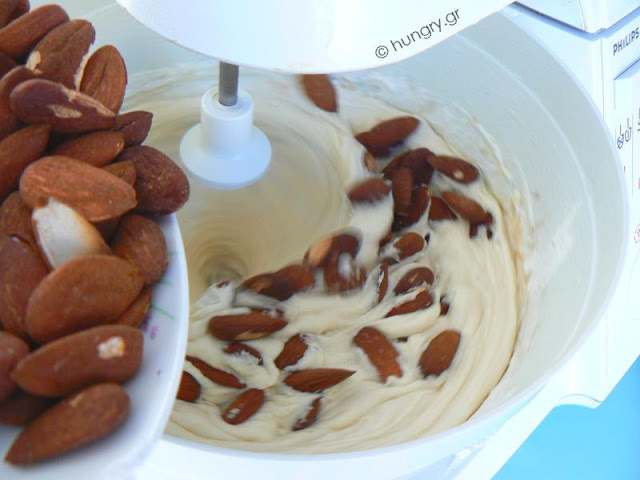 We prefer the almonds whole but you can break them if you like. In large, shallow baking pan, spread some baking paper. 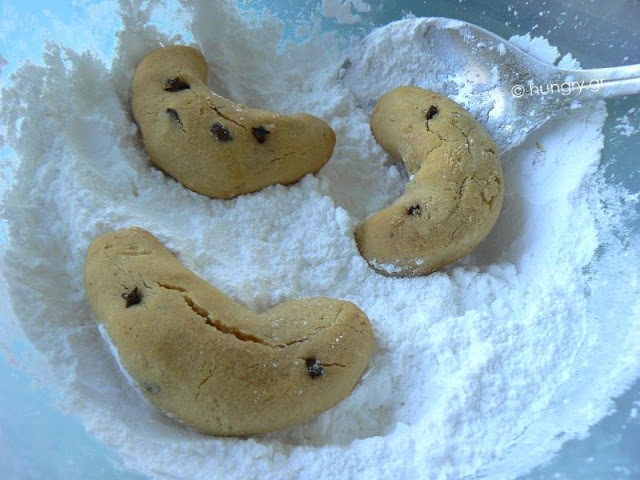 Knead with your hands thick, oblong sticks and bend them slightly to get the shape of the crescent. Put them to the pan and stick one or two clove pins. Bake in preheated oven at 200°C/ 400°F/ Gas 6, with resistance above and below, at the second lowest rack for ~30'. When they have browned lightly and cooked at the bottom too, remove from the oven and add a drop of rosewater, optional. * Put the second pan in the oven. As they are still hot, add them 2-3 together in powdered sugar. Carefully turn them on all sides, to sprinkle well, and get lots of sugar. Then put them on a large platter, with enough sugar in their midst. Repeat the same with the next tray. Sift additional powdered sugar on the platter, and let them cool. 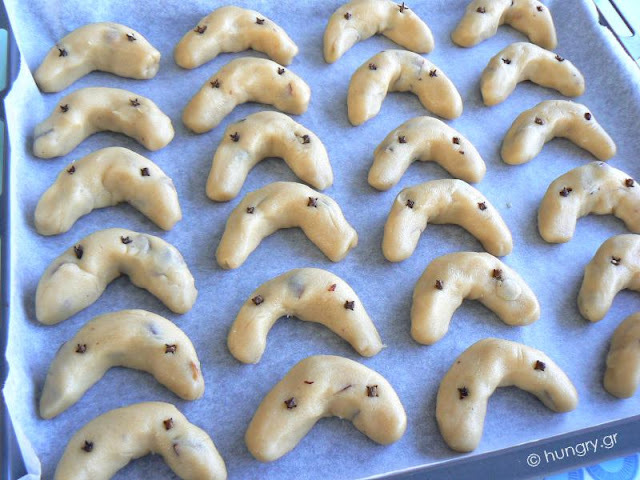 You have now 50 thick, hearty, full of almond kourabiedes.